While trade issues remain a top priority for the soy industry, the American Soybean Association (ASA) is taking a moment this fall to highlight the importance of monarch habitat in its overall conservation efforts, which include soil and water quality, and pollinator preservation. This week, ASA launched a month-long effort on social media to showcase the importance of monarch habitat. 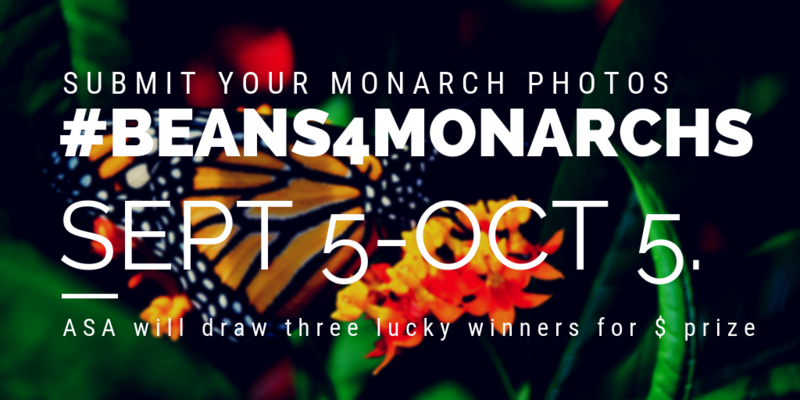 Three randomly-selected participants who post their unique monarch or monarch habitat pics on Facebook, Instagram, or Twitter with the hashtag #Beans4Monarchs during the contest period will be selected to each win one $100 gift card, to be awarded in October. ASA says that monarch habitat promotes biodiversity and sustainability near farmlands, including attracting pollinators, improving soil health and water quality, housing natural enemies of crop pests, and increasing wildlife diversity. Yet, the monarch population has been alarmingly on the decline since the 1990s. The goal of ASA’s #Beans4Monarchs program is to help turn around those declining numbers and promote fit farmlands through healthy monarch habitat.